It happened near theSea of Galilee, on a mild summer afternoon when Our Lord was busy healing the sick and preaching the Holy Gospel. It happened when a woman of great faith detached herself from the crowd of onlookers who were following Christ and dared to approach him. Her name was Veronica, and she was struggling with a chronic health problem in which she hemorrhaged continually, leaving her weak and anemic and constantly ill. Hoping for relief from this life-threatening ailment, she was content to approach the Lord silently and merely touch the hem of his robe. 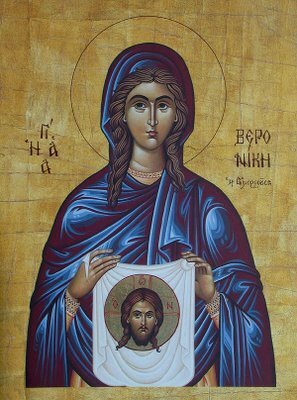 The moment in which St. Veronica dares to touch Jesus – out of her great hope that He can heal her – can teach us a great deal about the immense power to be found in our trust that God loves us and wants to heal us of our infirmities! In thee the image was preserved with exactness, O Mother; for taking up thy cross, thou didst follow Christ, and by thy deeds thou didst teach us to overlook the flesh, for it passeth away, but to attend to the soul since it is immortal. Wherefore, O righteous Veronica, thy spirit rejoiceth with the Angels. For love of God, O righteous mother Veronica, thou didst spurn the need for rest. By fasting thou didst make thy soul luminous and didst utterly defeat the beast. By thine intercessions do thou destroy the snares of the enemy.